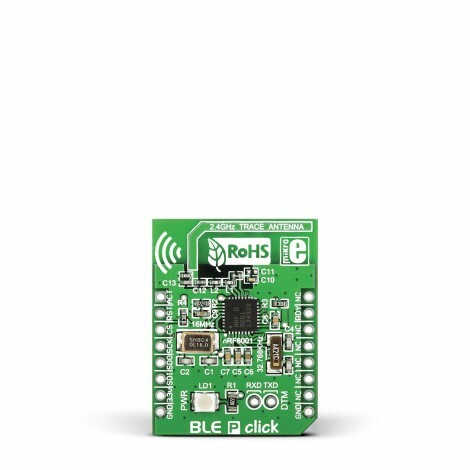 BLE P click carries the nRF8001 IC that allows you to add Bluetooth 4.0 to your device. 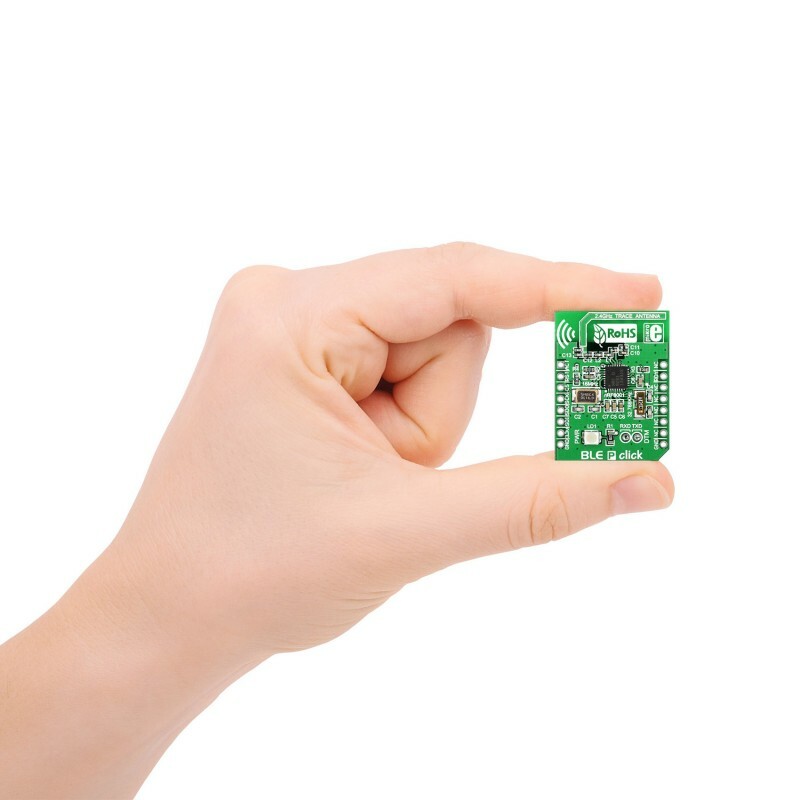 The click communicates with the target board MCU through mikroBUS™ SPI (CS, SCK, MISO, MOSI), RDY and ACT lines, and runs on 3.3V power supply. 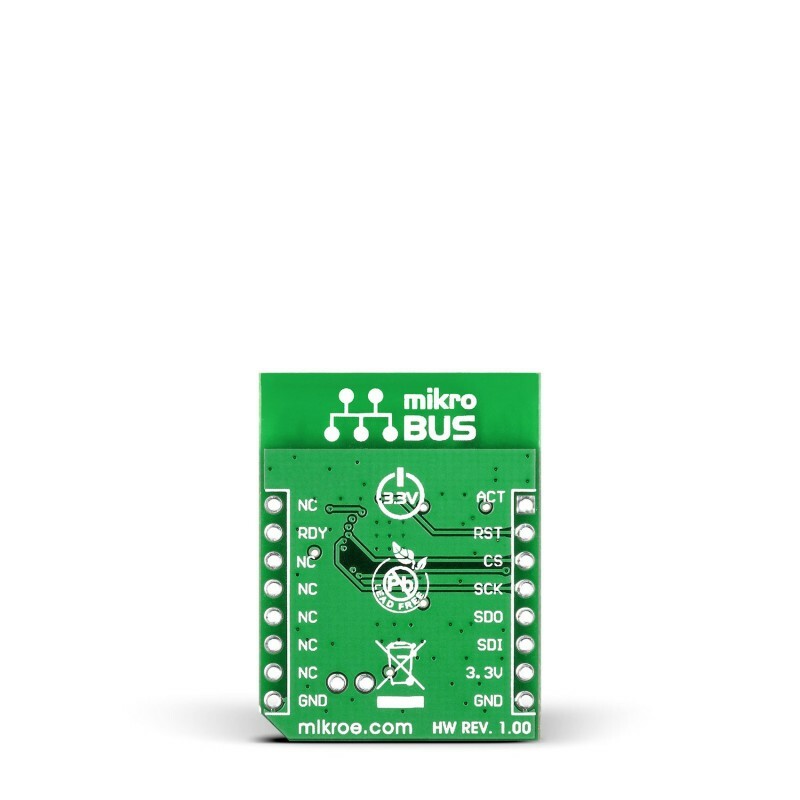 Beside the mikroBUS™ socket, BLE P click also features additional UART input and output pins (RXD and TXD). These enable you to test the RF parameters of the BLE P click’s radio design. 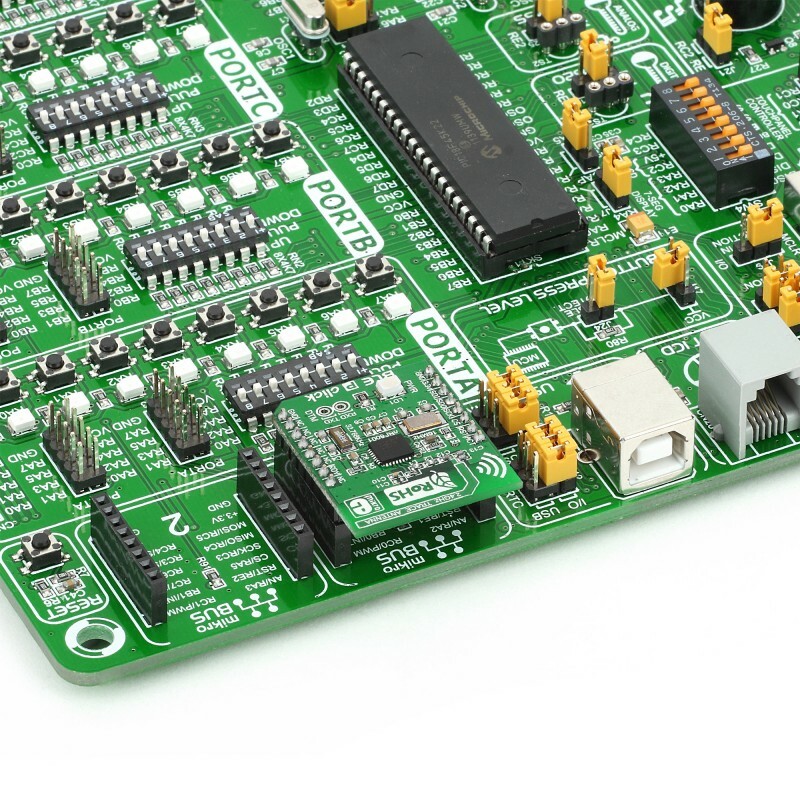 nRF8001 IC combines Radio, Link Layer and Host into a single product. The 16 MHz crystal oscillator is automatically enabled when nRF8001 requires it. The built-in stack features a low energy PHY layer, LE link layer slave, LE host for devices in the peripheral role, and a Application Controller Interface. 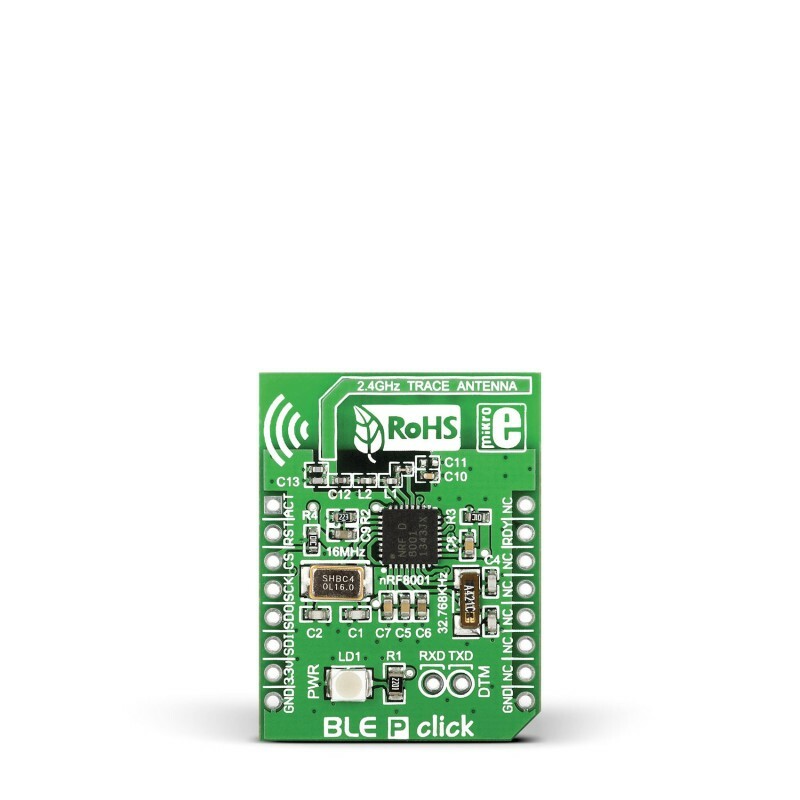 BLE P click features a PCB trace antenna, designed for the 2400-2483.5 MHz frequency band. Maximum device range is up to 40 meters in open space. The typical standby current consumption is only 2 mA. This kind of low power consumption is a great solution for today's smart devices, like fitness applications, medical devices, remotely controlling your home entertainment or home security systems, smart watches and many other things. It works by sending data when necessary and then powering down. BLE or Bluetooth 4.0 is Bluetooth Low Energy wireless network technology that allows users the same connection that the standard Bluetooth does but with much less power consumption. If you want to get started with BLE check out our BLE Android app that works on all devices with hardware and software support for BLE, just make sure you use it on Android devices. This table shows how the pinout on BLE P corresponds to the pinout on the mikroBUS™ socket (the latter shown in the two middle columns). The code sets up the BLE P click, then continually parses Bluetooth low energy messages.